The creators of L4D are trying to change the way we play multilayer with their upcoming game called Evolve. Evolve attempts to combine the world of co-op with the world of competitive multiplayer by pitting four players against one. Four on one doesn't sound awful fair at first until you realize that the one player gets to control a giant boss-like character, while the other four have to try to take them down with four traditional sized characters. Go here: http://evolvegame.com/sweepstakes/sweeps.html to enter the sweepstakes and take along 4 friends to PAX East to be the first to try it out! Looks like it stars Cyborg from Teen Titans, Some guy from Duck Dynasty, The Villain from Jumanji, & Jill Valentine from Resident Evil 1. I'd be willing to try it. I'll play this game. The classes of those four characters kind of remind me of FUSE. Here is the E3 trailer for Evolve! I'd definitely see myself choosing to be The Monster. Though I'd probably get my ♥♥♥ handed to me. 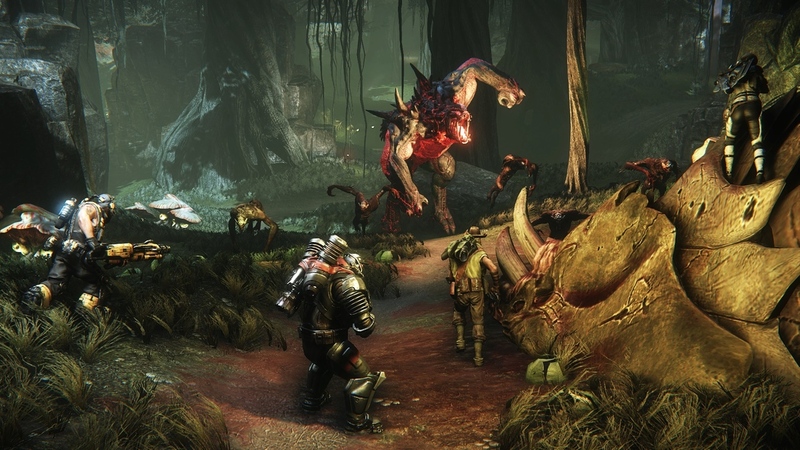 Evolve was delayed until February 2015. "We primarily decided that the title deserves and should have more time to be polished so it can reach its absolute optimal state before we release it," Take-Two boss Strauss Zelnick said on a conference call this afternoon. "Historically, we've always benefitted from giving the creative teams more time to polish their titles. We've never regretted it. It's not a meaningful amount of time; the title is still coming out in the fiscal year. We're really excited about the title. Coming out of E3, where it won best of show, it felt like the right thing to do to make absolutely sure this title could be its very best. "At the same time, I do believe February is a pretty terrific release window. It's not at all crowded, and we will benefit from the fact that there are a lot of holiday sales of consoles so the install base will be bigger and it should be an open time to release." I hope they take the time to make the campaign great for this game. I've been getting a bit burned out on "buy this game for multiplayer only" games lately.